Indian Prime Minister Narendra Modi is scheduled to visit China in May in what will be a significant foreign policy event for New Delhi. Modi will be seeking a solution to the nagging boundary dispute between the two countries and geopolitics should dominate the prime minister’s itinerary. Tensions have long clouded relations between the two Asian powerhouses, but they need not dominate Modi’s visit. If India and China want to find a way to collaborate, the answer may well lie in economics. Over the last few decades, relations between Beijing and New Delhi have run hot and cold. Border disputes have held them back, but the two countries have often managed to find common ground on economic issues. While China’s Maritime Silk Road has made news in India for all the wrong reasons, New Delhi itself has yet to explicitly and officially oppose the concept. In fact, many of China’s grand economic initiatives have come in collaboration with India. Both are founding members of the proposed Asian Infrastructure Investment Bank, for example, and both established the BRICS Development Bank last year. While India has often clashed with the United States in the World Trade Organization, India and China frequently find each other on the same side in the WTO, asking for the same things, from the right to export steel to America without discrimination, to allowing developing countries to maintain a larger food stockpile. Even on climate change, India and China hold fort together, asking the industrialized world to allow them greater leeway and calling for the easy transfer of green technology. This collaboration is quite natural. Whatever their disagreements on power politics, Beijing and New Delhi together represent nearly one-third of mankind, and share several similar economic problems. To many in the developing world, regardless of their political leanings, India and China represent the economic rights of poorer, emerging economies on the world stage, thereby making Beijing and New Delhi the natural leaders of the developing world. Yet, this economic cooperation and team spirit is more likely to be evident in multilateral forums than in bilateral ties. Despite being the largest economy on China’s periphery (in PPP terms), India is not even rank among China’s ten largest trade partners. Worse, trade has been falling. 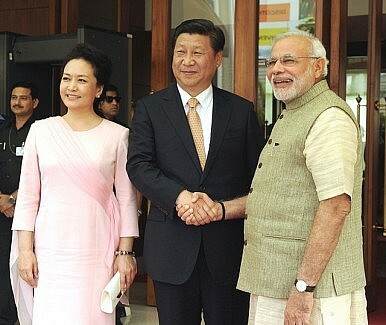 In 2011-12, bilateral trade between India and China stood at $73 billion. Two years later, it was less than $66 billion. New Delhi has been worried about the rising trade deficit between the two countries, and so has been trying to prune imports while boosting exports, although slowing growth in China is partly responsible for the decline. Given the size of the two economies, trade is far below its potential. There are challenges, however, to economic partnership. Many Indian are still deeply suspicious of the Chinese, given the ever-present border disputes and the shadow of the war of 1962. Even back then, India and China shared close ties as representatives of the developing world. India and China had established the Non-Aligned Movement only a decade prior to that war, in order to give the developing world an independent voice during the Cold War. Yet the inability of Prime Ministers Jawaharlal Nehru and Zhou En-lai to resolve the border dispute and political disagreements over Tibet precipitated a military conflict in the Himalayas. These political challenges are only more complex today. Half a century later, the border disputes remain unresolved. While President Xi Jinping was on a visit to India last year, the Indian military accused Chinese soldiers of infiltrating the disputed territory. Further complications are brought about by each other’s neighborhoods. While New Delhi is suspicious of Beijing’s engagements with its South Asian neighbors, Beijing is apprehensive about India’s increasingly close ties with its own neighbors in the Far East. Smaller nations in South Asia, for their part, seek to play China against India, just as China’s neighbors in the Far East want India to counterbalance the Chinese. Yet, for all the power clashes, nations in both South Asia and the Far East seem to wish to see India and China speak and act together on economic initiatives such as the Asian Infrastructure Investment Bank and the Maritime Silk Road. The challenge for India and China is to separate the geopolitics from the economics. If Beijing and New Delhi can do that, and cooperate more closely on their economic ambitions, it will likely bring benefits, not just for two of the world’s most populous nations, but also for their smaller neighbors. What's Next for Sino-Indian Ties After Wuhan?How to Fix India-China TradeThe China-India Defense DialogueAn Evolution in China-India Relations?Can India Assert Itself Against China?